My sophomores and juniors finally finished decorating their weave poems for the county fair. After writing some prose text about a person they remembered from their childhood and writing down the words of a song they remember being sung, they wove the two pieces together with some great results. One of my students is the son of a local man who recently lost his battle with cancer. Everyone called him “Sputnik”. The name fit him. In Russian, the term, “sputnik” is used to refer to a companion. The word “sputnik” represented something new, a new beginning, the space age. The Sputnik that we all knew was certainly a companion to many and was always trying something new or different. In a way, he represented new beginnings. His son wrote a great story in English class about the time that Sputnik and his brothers decided to go Christmas Caroling as adults while visiting Sputnik’s mother. The story would be enhanced if I had a photo of Sputnik and his brothers to share. There is no telling whether these guys had their hair combed, if they were clean shaven, or if they had on any nicer clothes than their work jeans and work boots. These brothers were known as being a bunch of “characters.” They told the family whose door they knocked upon that they would sing “Joy to the World”. Then, they broke into Credence Clearwater Revival’s version of “Joy to the World”. You may remember this song if you’re a baby boomer. Well, the story ends with the family who received the gift of Sputnik and his brothers singing a Christmas carol not only laughing but also inviting the guys in for some wine. The story doesn’t really end there because Sputnik left his son and many others hundreds of wonderful memories that bring a smile to our faces. To bring a smile to someone’s face, now THAT is a gift! Joy to You and Me! Every Monday I was planning to write about teaching and teaching tips. hmmmmm I had planned to include one of my student’s weave poems today, but I forgot to ask him permission. 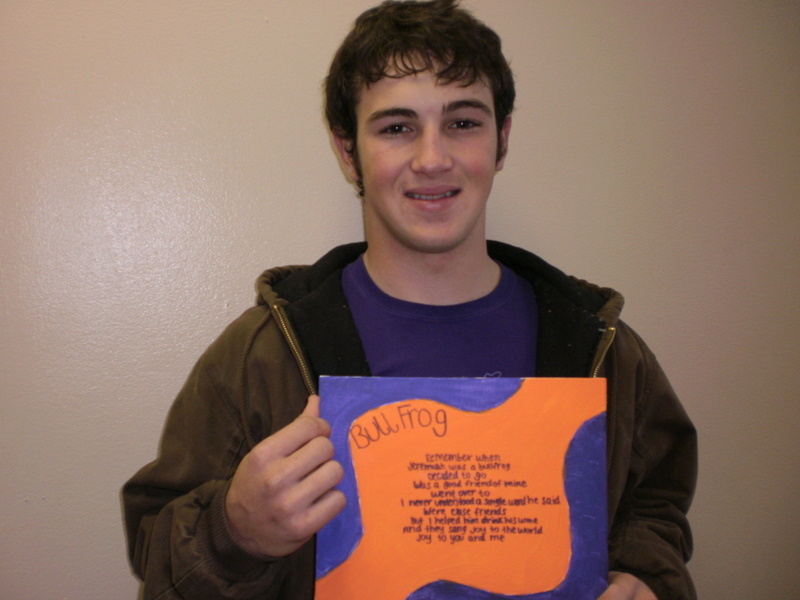 Last Friday, I went to Wal-Mart and bought art supplies (with my own money, of course), and today we began the attempt to make our poems look “cute”, “nice”, “good”, “artistic”, ….well, to look like they would be worthy of entering the San Saba County Youth Fair which begins this Thursday. The 10th and 11th graders really got in the spirit of decorating the poems. Some of the students are going to save their decorated poems as Valentine gifts for their moms or dads; others will save them for a Mother’s Day present. I’m really pleased with the result. I hope to have a photo for you in the near future. I also graded sources that the seniors have found for their research papers. I’m actually quite proud of their research. They’ve done a decent job. When our Region XV Service Center told us that they could no longer afford the Ebsco Data Base we used to find all of our articles online, I panicked last year. What to do? Having been a county librarian, I was familiar with the library network and set to work to get all of my students a library card from the Tom Green County Library in San Angelo, Texas. We got that accomplished during the first semester. Now, each student is able to get on a laptop and use the online resources of that library which is a two hour drive from us. Sometimes, I think technology is just the greatest invention ever! Our school is so small that our reference section is near to none although we have the best librarian ever! Mrs. Gossett has created a comfy, cozy learning area and has used all of her creativity to raise funds to have adequate books for grades K-12. Anything that a person requests, Mrs. Gossett finds a way to get it. More on our wonderful library in another entry. Stay tuned! Okay, this blogging thingy is more work than I thought! I’ve really fallen behind as I got busier and busier at school this week. I did want to share with the world my big news at school. An assignment for my junior English class was to enter the Central Texas Telephone Cooperative’s essay contest. The contest includes around 15 schools. The first place prize is a free trip to Washington, D.C. in the summer with 100 other students. The prize even includes spending money. The other places receive cash or savings bonds. Tomorrow morning, a CTTC representative will be at our school to announce to my junior English class the winners, and the tiny school of Richland Springs has won 1st, 3rd, 4th, and 5th places!!!!! Woo! Hoo!!! I am so, so, so excited. I can’t wait to find out WHO has won! Our “weave” poems are coming along, slowly but nicely. The juniors and the sophomores are both creating weave poems in our English classes. We hope to enter some of them in the county youth fair. Finally, our contest play, the One Act Play, is coming together. We are doing Steel Magnolias, and I’m enjoying the 6 young actresses so much! They are fun and funny!